Juba is looking for someone to join his band to play the bongos. Click here to play! Help Juba out and you could be playing a few gigs that will gain you a massive paycheck. Remember that Juba is running the show in this Congo Bongo band. Be sure to spin as many Juba symbols as possible because he acts as a substitute and will replace most other symbols to help you bring in more wins. He will also payout up to 6000 times your line bet if you can spin two to five across a payline. Plus, you’ll need to round up the instruments to pull off the next gig. 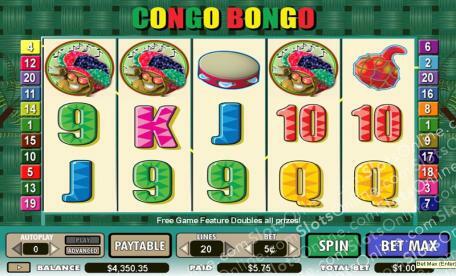 Spin in two to five bongos to get up to 2000 times your line bet. Two to five steel drums will get you up to 1000 times your line bet. Gourds and tambourines will also payout, so be sure to gather those as well. Juba’s pet toucan is the unofficial mascot of this Congo Bongo band, so be sure to spin him across the reels. He is a scatter symbol that will not only multiply your total bet, but he will trigger a bonus feature if you can spin three or more anywhere on the board. Join Juba’s band and play the night away for a chance to bring in plenty of big money wins. The colorful toucan is a scatter symbol. Spin two to five of them anywhere on the board and you will multiply your total bet by 2, 5, 10, or 100 times respectivley. If you can spin three or more anywhere on the board you will trigger 20 free games in which prizes are doubled. Juba is a wild symbol and will replace all other symbols (except scatters) to help you bring in more winning combinations. He will also payout up to 6000 times your line bet if you spin two or more across an active payline.